This course will provide you with an introduction to deep foundations. A deep foundation derives its support from competent strata at significant depths below the surface or, alternatively, has a depth to diameter ratio greater than 4. A deep foundation is used in lieu of a shallow foundation when adequate bearing capacity or tolerable settlements cannot be obtained with a shallow foundation. The term deep foundation includes piles, piers, or caissons, as well as footings or mats set into a deep excavation. This publication discusses problems of placing footings and mats in deep excavations and design of drilled piers. Drilled piers (or caissons) are simply large-diameter piles, but the design process is somewhat different. An arbitrary distinction between a caisson and pier is that the caisson is 30 inches or more in diameter. Learn about settlement issues adjacent to excavations. This course is intended for civil engineers, structural engineers, geotechnical engineers, geologists and other design and construction professionals wanting an introduction to deep foundations for buildings and other structures. This course will give engineers and others an introduction to the types of deep foundations and when they may be applicable. 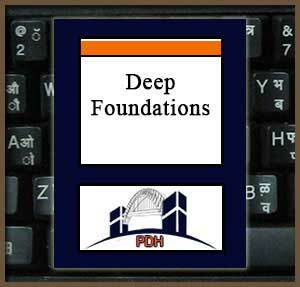 This is an introduction to deep foundations including piles, piers and caissons. This course will give you an introduction to methods for analysis and design of deep foundation.